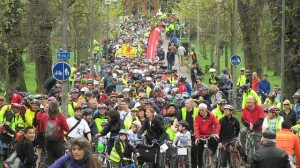 Thousands protest at Pedal on Parliament (photo by Chris Hill). On Saturday, people by their thousands took to the streets of Edinburgh to protest road danger and demand that their elected representatives make substantial changes to the transport infrastructure and laws. This year’s event came just weeks after the driver of a 55 foot articulated lorry was acquitted of causing the death of Andrew McNicoll as he cycled to work along Lanark Road in January 2012. This is the third year for the Pedal on Parliament protest – each attracting more people than the previous one. Estimates are that about 4500 people protested this year – many of whom were families: FAMILIES TO THE FORE FOR THE THIRD PEDAL ON PARLIAMENT. 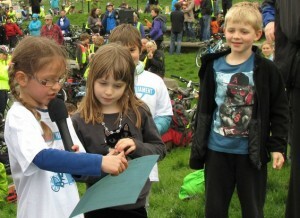 Children address the protesters and politicians at PoP 2014 (photo by Chris Hill). Transport Minister Keith Brown at Pop 2014 (photo by Chris Hill). 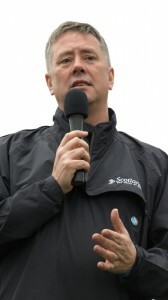 The growing visibility meant that government could no longer ignore the voices being raised: Transport Minister Keith Brown attended the protest to defend his government’s policies. He announced £4.5 million over 2 years for promoting cycling training. …educating children to cycle on the road is not the best use of money, compared with starting to invest in a cycling network where they can actually be safe, and more importantly feel safe, as they get around on two wheels. There’s no training in the world that will guarantee a child’s safety around HGVs and fast-moving cars – and as long as children need to mix in traffic to ride their bikes, then parents will be reluctant to give them the freedom to ride. Thankfully, that message is being heard and taken on board by a growing number of politicians – the organisers are continuously updating their list of supportive MSPs and quotes: POLITICAL RESPONSES. The protest was front page news and received wide coverage in the media – a full list is being updated by the PoP organisers: MEDIA COVERAGE. The BBC gave it headline coverage on their TV broadcast and news website: Thousands take part in Pedal on Parliament event in Edinburgh. 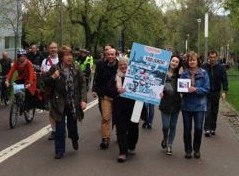 Lynne marches with councillors and MSPs in Pedal on Parliament 2014. 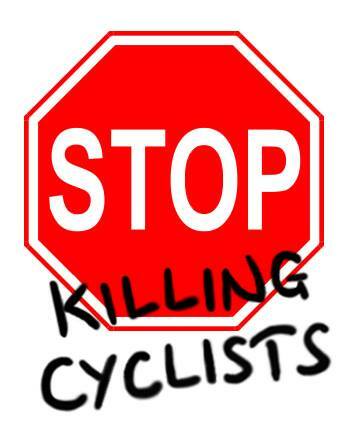 A leading campaigner for reducing road danger is the step-mum, Lynne, and father, Ian, of Andrew McNicoll – who was killed in a collision with a 55ft long articulated lorry in Edinburgh as he commuted to work on his bicycle. The driver of the lorry was recently acquitted of causing his death: Man cleared over death of cyclist Andrew McNicoll. “it was so good to see politicians in some numbers with us: MSP Alison Johnstone, Cllr Cameron Rose, Transport Minister Keith Brown, Cllr Andrew Burns. for anyone of any age to cycle safely. A time-lapse photo of people cycling to the protest is HERE.